MRTeam was proud to be a sponsor of Sutherland Local Area Command’s 2nd annual ‘Sutho Cops & Rodders Road Safety & Car Show’. The educational festival was held at Boys’ Town Playing Fields, Woronora Rd, Engadine on Sunday October 14, 2012. 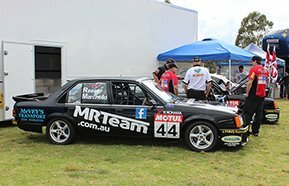 MRTeam was on display with our race cars and custom built race car transporter alongside the V8 Supercars and other sponsors of the event. The aim of the event was to reduce road trauma and promote safe driving. The festival was a huge success attracting around 25,000 visitors! There was lots of fantastic entertainment and educational displays organised for the day including but not limited to Shannon’s Insurance Super Rig, Orrcon Steel Simulator, RAAF Military Dog Unit performing around an obstacle course and 'rings of fire', Australian singer/songwriter Helen Barron performing a 'Thank You' song with more great hits and Australia's best AC/DC tribute band 'Dirty Deeds' performing riffs from one of Australia's greatest bands. Children were further entertained with amusement rides and emergency services displays. Guest speakers included V8 Supercar Orrcon Steel Racing Team V8 Supercar driver Mark ‘Frosty’ Winterbottom, Australian Motor Racing Hall of Fame and legend, Jim Richards and V8 Utes Jesus Racing Team and driver Andrew 'Fishtail' Fisher. We would like to thank our wonderful corporate partners Lynns Removals & Storage, McVey’s Transport, EmbroidMe Penrith, SIGNARAMA Surry Hills, Wishart’s Paint Solutions, Ulladulla Smash Repairs, Heidi Yi Mineral Cosmetics and Ulladulla & Batemans Bay Furniture One for their amazing support!